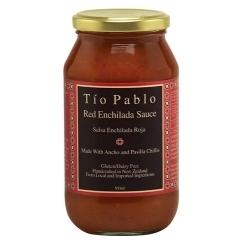 Home > Tio Pablo Enchilada Sauce. 500ml. In Mexico, the "comida" is the main meal of the day - a time to relax with family and friends while enjoying a hearty, soul-satisfying plate of comfort foods. One of the classics for comida is the Mexican casserole. enchiladas rojas (with red sauce). This dish, which features a tortilla rolled around succulent fillings of cheese, seasoned meats and herbs and covered in a rich, red sauce, brings together the full measure of Mexican flavours: the subtle liquorice, plum and bittersweet taste of dried Ancho and Pasilla chillis balanced with cooked tomatoes, melted cheese and corn tortillas.